Outdoor enthusiasts have been familiar with Arizona Boating & Watersports news magazine. However, as the publication expanded its coverage to include camping, fishing, hunting, RVing, safety and wildlife, it was felt the name needed to reflect growth into new and varied content. 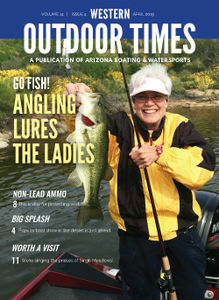 Therefore, Western Outdoor Times now appears above the parent name Arizona Boating & Watersports, the original branding of the paper.